Being advocates of ‘miracle products’ MCKEP spends the majority of it’s Research and Development budget on products to improve athlete performance (without any additional training). Whilst much of MCKEPs hard earned has been wasted on a myriad of supplements, a notable few have repeatedly found themselves in ‘my basket’. One of those items, Beetroot Juice, has become a favourite – not only for it’s comically coloured urine production ability – but apparently it actually does something! Up until now there has only been one notable producer of Beetroot based juice goods available on the high street – “Beet It” products include beetroot juice (now of varying blends), and also the rather potent concentrated beetroot shots… not widely available, but can be found in Holland and Barrett stores, and the juice occasionally available in larger supermarkets. 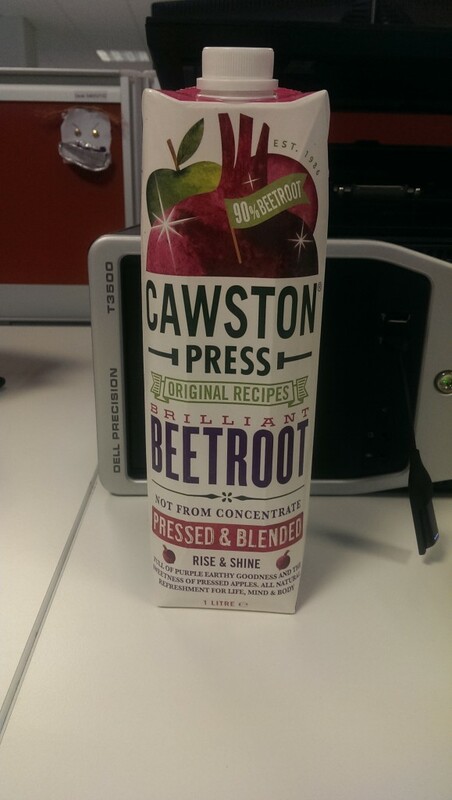 In light of this – MCKEP are proud to announce, fresh from the press at MCKEP’s HQ* in Cawston, Rugby… “Cawston Press Brilliant Beetroot”, offering a refreshing alternative to “Beet it” a snip at £2.09 for 1litre compared to the £2.99 for the equivalent “Beet it” product (prices correct as of 02/04/14 at Tesco, Southam). Early tasting confirms that it does indeed taste like beetroot juice. A fantastic success – two thumbs up. April 3, 2014 in Food.